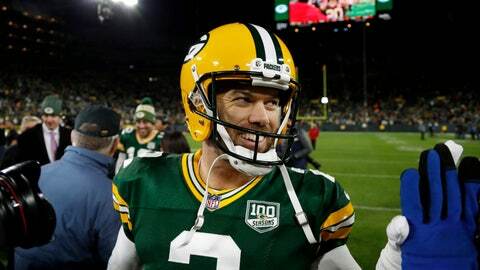 GREEN BAY, Wis. (AP) — Mason Crosby smiled as he left the field. It was quite the week for the Green Bay Packers‘ veteran kicker. Crosby hit four field goals, including the winner from 27 yards as time expired to lift the Packers past the San Francisco 49ers 33-30 on Monday night. “This week was a grind, it was one of the tougher weeks of my career,” Crosby said. It began with rare questions about Crosby’s reliability following four missed field goals and an extra-point try in a 31-23 loss in Detroit last week. It ended with a perfect night against the 49ers. He also hit from 29, 39 and 51 yards, and made all three extra-point attempts. The drive that led to Crosby’s winner was extended after cornerback Richard Sherman was flagged for illegal contact on third-and-15 that wiped out a sack with 43 seconds left. Rodgers rushed up the middle for a 21-yard gain on the next play. The two-time NFL MVP completed two more passes for 19 yards to set up Crosby’s winner for Green Bay (3-2-1). “It doesn’t matter if you agree with the call. It’s not like, ‘Oh, I didn’t agree with the call, they’re going to pick it up.’ They called it. I’ve got to find a way to do better,” Sherman said. Rodgers threw for 425 yards and two scores, both to Davante Adams. The second came with 1:55 left from 16 yards to tie it at 30. The Packers didn’t waste a second chance to get into field-goal range after the penalty on Sherman. After a spike to stop the clock with 19 seconds left following his 21-yard scramble to the Packers 45, Rodgers hit three straight passes to move Green Bay to the San Francisco 9. The receivers got out of bounds after each of play to buy more time. “Just the time, and just really the menu (of plays) and the operation, that was a clinic,” coach Mike McCarthy said. For a while it looked like they might hold on for their first victory since quarterback Jimmy Garoppolo was lost for the year in Week 3 with a torn ACL. Turnovers hurt them again — three more on Monday night, but none bigger than cornerback Kevin King’s interception of a deep pass down the middle at the Packers 10. A second-year cornerback, King was locked in 1-on-1 coverage with Goodwin, who had burned the secondary all night. This time, King kept up and pulled in a ball that looked slightly underthrown by Beathard. “I’ve just got to stay the course, keep doing your job, keep it going, and those types of plays are going to come,” King said. The Packers had 17-7 lead when Rodgers connected with Adams for a 9-yard touchdown with 1:58 left in the first quarter. Goodwin had a 30-yard score with 6:05 left in the second. Goodwin, who finished with four catches for 126 yards, celebrated by mimicking a long jump in the end zone. Beathard was 16 of 23. Another game without a takeaway for the Niners dropped them to an NFL-worst minus-11 in turnover differential. The defense had generated a league-low three takeaways coming into the night, the fewest for the franchise after five games since 1977. The Packers got the 49ers to bite on play-action early that resulted in open passes to Jimmy Graham and Marquez Valdes-Scantling. Rodgers found Valdes-Scantling for a 60-yard completion on the Packers’ first play from scrimmage, setting up Ty Montgomery’s 2-yard touchdown run with 9:20 left in the first quarter to tie the game at 7. Graham and Valdes-Scantling each finished with more than 100 yards receiving. Adams had 10 catches on 16 targets with a game-high 132 yards and two scores. It was a promising night for a passing game with receivers Randall Cobb and Geronimo Allison both sidelined again with hamstring injuries.